At synagogue on Simchat Torah, there is plenty to keep the kids engaged and happy, especially at the evening service. Flag-waving, candy-scarfing kids can also carry toy Torahs on the noisy processionals (hakafot); beat kosher rhythm instruments with our drumming Rabbi (wicked on the bongo); and join on the bimah for the once-a-year children’s aliyah. The latter is the real liturgical highlight for me: seeing the kids—babies up through disaffected middle-schoolers—all hunched together, sheltered under giant prayer shawls held aloft by some of the taller parents. Beautiful. But at home, before Simchat Torah, there is not so much going on. Sukkot is still unwinding, true. I am still schlepping the electric fan out to the sukkah for meals (to blow the clouds of mosquitos from our table). But there is a lull compared to the frantic first days of Sukkot. Perfect time for an instant edible craft to prepare for Simchat Torah. 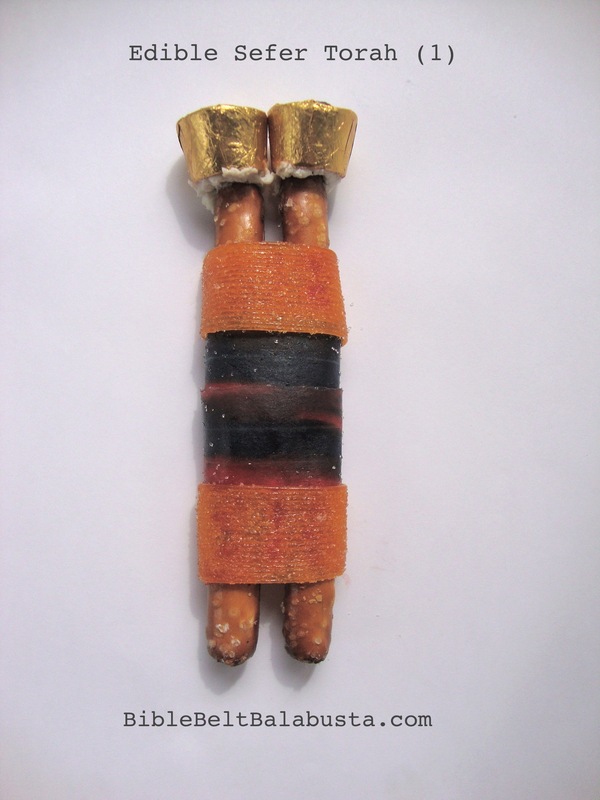 The pretzel stick Edible Torah Scroll is quick and easy. No baking, no melting chocolate in a double-boiler. Plus, you might already have the materials lying around. 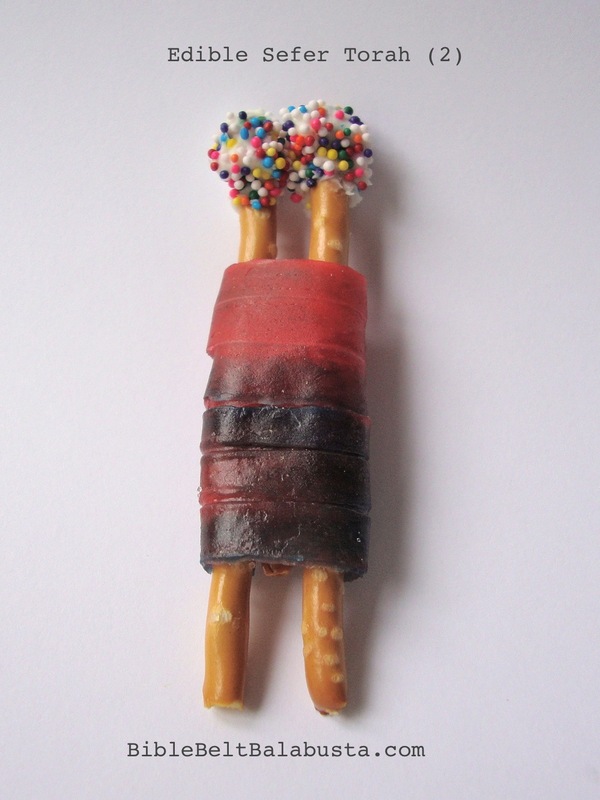 If you made edible sukkahs, find the leftover bag of Snyder’s Pretzel Sticks, which are perfect for the mini version. 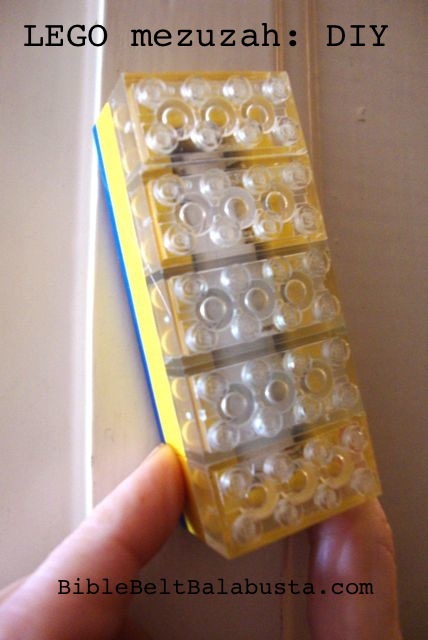 Use the larger Rods or the shorter, plumper Dippers for different sized scrolls, as you wish. • Frosting (to dip the tops of the sticks into). Use peanut butter or soy-butter if you’d rather. • Sprinkles (to stick to the frosting and approximate decorative finials on your scroll). Gold or Silver Wilton’s edible glitter dust is killer. If your pretzels are too close together and look weird, add a broken piece in between before you roll the fruit leather around them. The broken piece acts a a spacer, the better to mimic the bulk of a tiny scroll inside the mantle. If you use the thicker Rods, top them with an inverted Rolo still in a golden wrapper. It looks like a proper finial or set of rimmonim. Or, use a wrapped, silver Hershey’s kiss stuck on with frosting. (A chocolate chip works fine for the tiny Sticks). 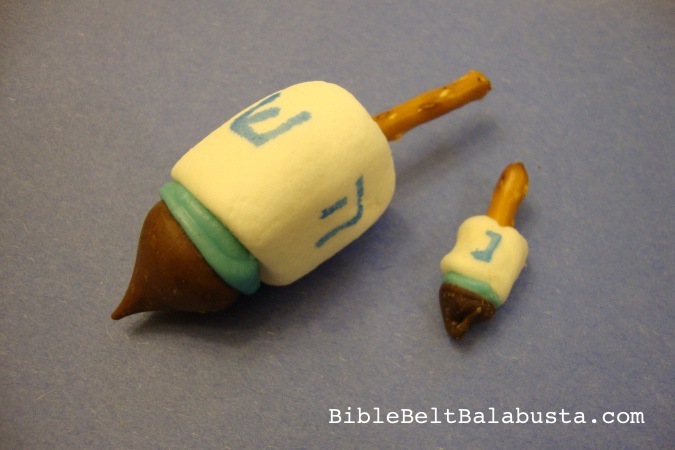 Edible Torah Scroll. Resemblance to bacon wrap is unintentional. Add a yad, or Torah pointer, made from caramel string or Pull ‘n’ Peel Twizzler (licorice whips) and a bit of pretzel Stick. Hang it from the wooden roller on the right. 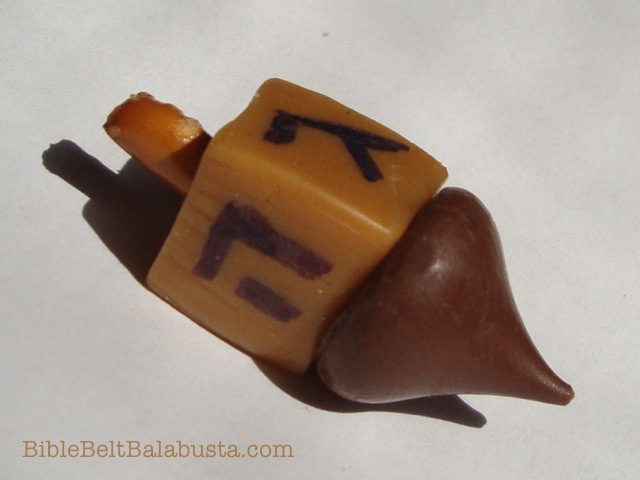 Add a Torah breastplate made of whatever candy that can reasonably suggest a breastplate. 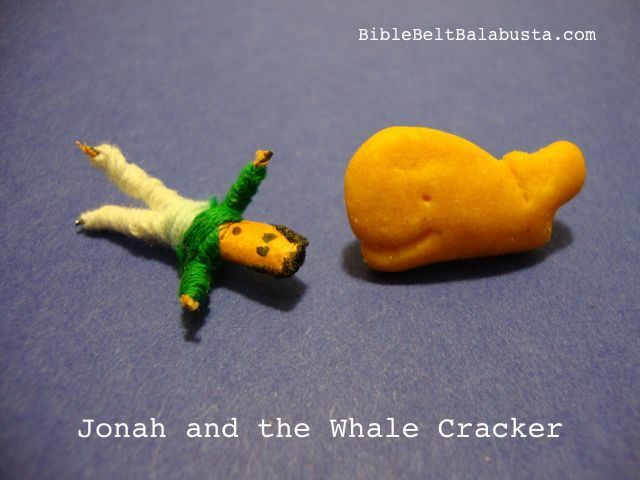 Bottlecaps, graham crackers, Chex cereal, etc., depending on the size of your Torah scroll. If you are making a big scroll, go ahead and stick 12 different-colored Jelly Bellys on the front to represent the twelve tribes. I dare you. Healthy version: If you feel compelled to be scrupulously nutritious, even on a holiday, wrap a tortilla around carrot, celery, or pretzel sticks. Use hummus or cream cheese as the edible glue. Tie the mantle with a chive. As for the finial or crown, hmmmmm. What would work? A carved radish, perhaps? A radish could be made to resemble the real rimmonim, sure, like mini pomegranates. I have the utmost respect for this level of health-consciousness, but on holidays I prefer Rolos and frosting. UPDATE (10/2015): For K-3 classes today, we used tortilla as the parchment and we skipped the mantle. This way, the students were able to write Hebrew words or letters on their “parchment” with food-safe markers. Some kids wrote their Hebrew names. One class had just learned gimmel in their Hebrew lessons, so they wrote a bunch of gimmels. Some kids wanted to spell Simchat Torah, etc. It was ever so fun. We secured the parchment with one strip of fruit roll-up, which sticks to itself. Yes, a real sefer Torah was in the room, and we undressed and dressed it to prepare for our re-creation with edibles. Finials: sometimes the Torah rollers are each capped with metal finials rather than a single crown. The finials might have little bells and ornaments called rimmonim, but the word rimmonim can also be used to describe the finials themselves. Ahklah page on Simchat Torah. TorahTots page on the Sefer Torah (the Torah scroll). 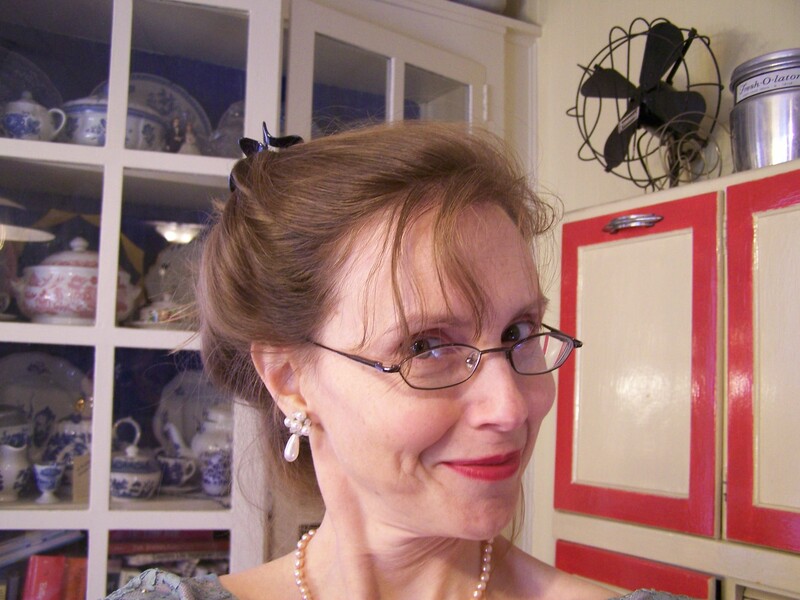 MyJewishLearning.com page on Simchat Torah 101. This entry was posted in Activity, Crafts, Edible Craft, Simchat Torah and tagged scroll, Torah. Bookmark the permalink. You are made of So. Much. Win. This is pure awesome. Thanks so much for the stickers, by the way! I expect I will be able to put them to good use. Yipppeeee and Thank You. 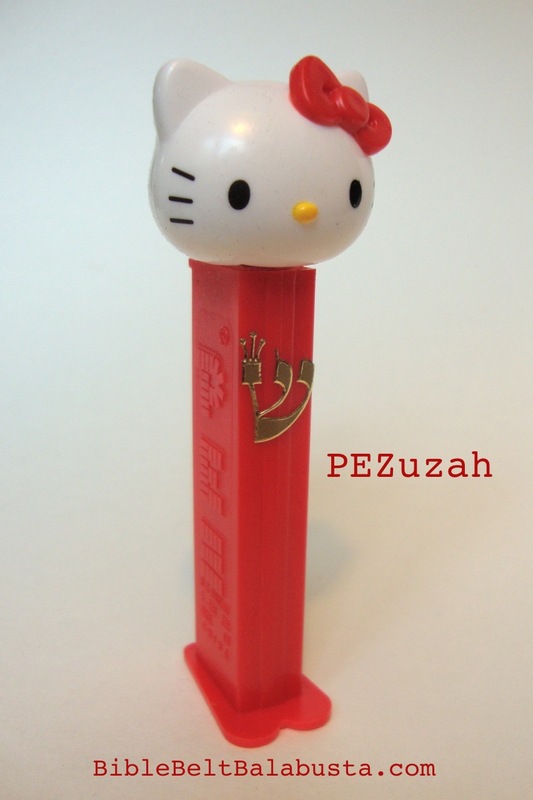 If I can get more of the PEZ-size stickers, I’ll let you know. They are the stickers of the world. I love your projects. I run an afternoon program for children 4-6 yrs old (tsaharon, in Israel), and I can’t wait to do this for these for our Parsha projects. Cool. I wish I could see pictures. Thank you for letting me know! This is great! Thanks so much! We are studying Ezekial next week (whom God commanded to eat a scroll) so this will be a perfect exercise. Ha! I never thought of that connection! Thanks. Hope you have tons of fun.